HYANNIS, Mass. 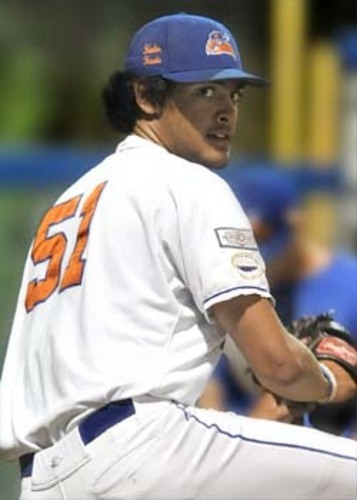 – Flame-throwing southpaw Sean Manaea (Indiana State) of Hyannis accomplished a rare clean sweep by winning two of the most coveted postseason honors in the Cape Cod Baseball League. The 6’5”, 215-pounder captured both the B.F.C. Whitehouse Top Pitcher Award and Robert A. McNeece Outstanding Pro Prospect Award after posting a 5-1 record with a 1.22 ERA and a league-leading 85 strikeouts for the Harbor Hawks. “It’s been a great summer here on the Cape and I couldn’t have asked for anything better in terms of my teammates, great competition and the kind of recognition this (season) has brought me,” said the personable left-hander after receiving both awards Monday during pre-game ceremonies at McKeon Park from CCBL Commissioner Paul Galop and CCBL President Judy Walden Scarafile. Manaea, reportedly clocked at 98 miles per hour in a relief outing at Orleans on June 27, earned a starting spot on the mound for the West squad in the Cape Cod Baseball League All-Star game July 28 in Harwich, where he hurled a scoreless inning with two K’s and was named Coca Cola Pitcher of the Week #6 on July 23. His top regular season performance was against Falmouth on July 19 when he struck out four of the first six batters and maintained a no-hitter until the end of the sixth inning. He finished with 92 pitches in seven innings, allowing two hits and striking out a league-high 15 batters. Hailing from Wanatah Ind., Manaea pitches for Indiana State and ended 2012 going 5-2 with a 3.50 ERA and 16 starts. He posted 106 strikeouts in 97.2 innings, making him one ten pitchers in ISU history with over 100 strikeouts in a single season. One of his season bests included tossing nine scoreless innings at Creighton.